Here is the Shelter Island Reporter Homeowners’ Network for Aug. 14, 2014. If you are interested in placing an ad, please call Karen, 631-354-8029 or email [email protected]. KATHARINE SCHROEDER PHOTO | State lawmakers have approved a boat safety bill of their own. A state boating safety bill awaiting Gov. Andrew Cuomo’s signature would supercede the Suffolk County legislation set to take effect in the fall. First District State Senator Kenneth LaValle (R-Port Jefferson), who supported the measure, said he anticipates the governor’s approval. “When you have counties involved already on a very high profile matter that’s got peoples’ attention, I’d expect the governor to sign it,” the senator said. “You don’t throw a person the keys to a car without lessons. Educating people on boating safety makes good sense. The bill says that six months after its approval all boat operators younger than 18 must take boating safety classes and obtain a safety certificate. Within a year anyone over 18 who is not a registered boat owner must secure a safety certificate before operating a vessell. After two years all boaters must be certified. Penalties for first offenders would range from $100 to $250. The Suffolk County bill requires resident boaters to attend safety classes and pass a test before obtaining a required boating safety certificate. Non-county residents would not need a certificate before taking to the water. Mr. LaValle said it is not clear if the courses offered by the Coast Guard Auxiliary in anticipation of the county law taking effect would satisfy the state requirement. BARBARAELLEN KOCH FILE PHOTO | Baykeeper Kevin McAllister. 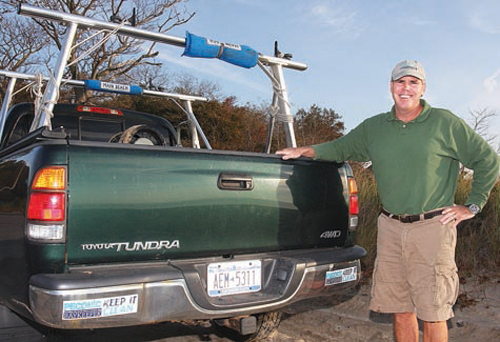 The North Fork Environmental Council will honor baykeeper Kevin McAllister as its environmentalist of the year during an awards ceremony in Riverhead next month. The organization will give Mr. McAllister, who for 15 years has advocated for the health of the Peconic estuary system and its wildlife, with its Richard Noncarrow Environmentalist of the Year award on Thursday, May 16 at the Suffolk County Community College’s Culinary Arts Center in downtown Riverhead. The NFEC says Mr. McAllister has worked over the past four years to show the connection between the health of the North Fork’s groundwater supplies and the health of its coastal waters. “Kevin wears his passion on his sleeve, but it’s his work ethic, his dedication to doing what is right and his ability to challenge us to be better stewards of our lands and waters, of our future, which makes him stand head and shoulders above the rest,” Bill Toedter, NFEC president, said in a press release. The organization will also name the late Bob Conklin, a former Riverhead science teacher, and Jim Miller, the founder of Miller Environmental, its Environmental Champions. Both were instrumental in the installation of a fish ladder allowing alewives, a herring-like fish, to return each year to their spawning grounds long blocked by the dam in Grangebel Park in Riverhead. Information is available by calling 298-8880 or at nfec1.org. The three East End Hospitals and Empire Blue Cross have reached an agreement that puts the health care facilities back into the insurance company’s network. The hospitals — Eastern Long Island Hospital, Peconic Bay Medical Center and Southampton Hospital — announced the deal on their websites Saturday. They fell out of the network on March 31 when negotiations with Empire Blue Cross failed to replace the reimbursement agreement that expired that day. The immediate impact for many Blue Cross customers was that the cost of elective surgery, such as for a joint replacement, would in most cases come in at the higher out-of-network rate. The hospitals and the insurance company said additional details would be released at a later time. TIM KELLY PHOTO | Southold Police Chief Martin Flatley with missing persons experts from the National Center for Missing and Exploited Children. Southold Police do not anticipate filing any criminal charges in connection with the disappearance of Peconic teenager Ashley Murray, Police Chief Martin Flatley said Monday. Police say they know where the teen was during her absence, but the chief declined to give the location. Ashley, 16, failed to show up at Southold High School Feb. 25 and she was gone 11 days before she and an adult friend showed up at town police headquarters in Peconic Friday afternoon. The chief said Ashley spent only one night in the hospital after turning herself in and is now in the care of another family. “When she was being interviewed it became evident she didn’t want to be home,” the chief added. The police will conduct a few more interviews before closing out the case, he said.